Posted on 27, September 2016 by EuropaWire PR Editors | This entry was posted in Awards, Energy, Gas & Oil, Finland, Industrial and tagged Asian Power Awards, best dual-fuel power plant of the year, PT Indonesia Power, PT Pembangunan Perumahan, Tim Charlton, Wärtsilä. Bookmark the permalink. 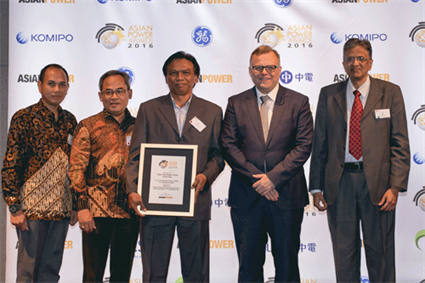 HELSINKI, 27-Sep-2016 — /EuropaWire/ — Asian Power Awards has announced the winner for the best dual-fuel power plant of the year, PT Indonesia Power with their 200 MW power plant PLTDG Pesanggaran Bali. The project was executed in a consortium with Wärtsilä as the lead partner together with PT Pembangunan Perumahan (Persero) Tbk (PT PP), one of Indonesia’s largest construction contractors. The Asian Power Awards annually recognizes ground-breaking projects and trailblazing initiatives in the power sector in Asia. According to the jury, PLTDG Pesanggaran Bali stood out among the nominations with its large nominal output. Additionally, it is the largest engine based power plant in Indonesia. “The power plant ensures greater reliability in the supply of electricity to both domestic and industrial consumers on the island of Bali. The fuel versatility of this plant provides valuable flexibility of operation and reliability to PT Indonesia Power’s customers,” says Tim Charlton, Editor-in-Chief of Asian Power. The plant is powered by twelve Wärtsilä 50DF dual-fuel engines. When the plant first started its operations in May 2015, it ran on HFO while the Tanjung Benoa LNG storage and regasification terminal was being built. Since July 2016, LNG has been readily available and the power plant has moved to running on natural gas. Currently, Wärtsilä has altogether approximately 3,500 MW of installed power in operation and projects under execution in Indonesia. Wärtsilä also has service agreements for more than 350 MW of generating capacity in Indonesia.